I woke up early Sunday morning and as I was in the midst of brushing my teeth, I felt this strong urge that something wasn’t right. And then it hit me. I should be racing right now. Now I hadn’t had a “senior moment,” as my dad likes to say, and completely forgotten about a race. No way my “Running OCD” would let something like that happen. But it was true, I should have been racing today, but I wasn’t. Why not? Because the race simply wasn’t there. The race I speak of is the 2014 Los Angeles 13.1 Half Marathon. How did I know it was supposed to be today? Because for the 4 years of its existence, the race had been run on a Sunday in mid-January. And I had run 3 of them. NOTE: I was signed up for the 2013 race, but unfortunately had to miss it (the only race I’ve ever had to pass on). I’ll share that story with you in a future post. The race happened in 2010, 2011, 2012 and 2013, but is absent this year. So what happened to 2014? It was cancelled. 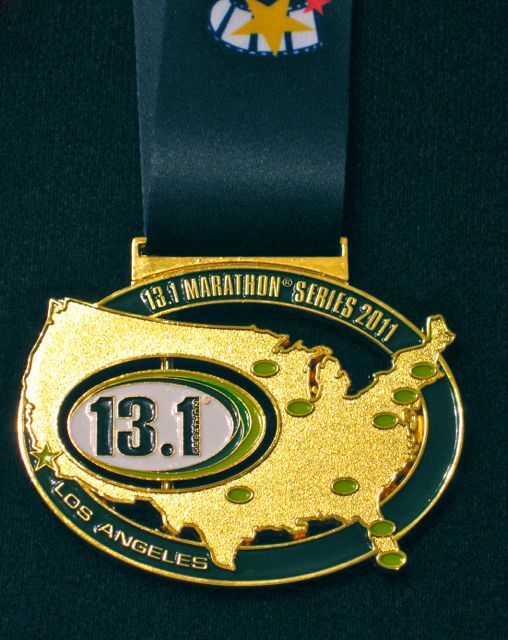 When I contacted the 13.1 Marathon Series, they simply explained the race was on hiatus (for an unstated reason) for this year, but they hoped to have it back in 2015 or some other time in the future. The scary thing is this is not the only race I’ve run that has ended up on the chopping block. The Pasadena Half Marathon (that I’ve run twice) has also been cancelled for 2014… in fact, the city of Pasadena lost two marathons this year because the Rock ‘n’ Roll Series nixed their race as well. “Missing marathons” seem to be more frequent (or at least more publicized) as of late. And I’m not talking about races cancelled due to adverse weather conditions or “Force Majeure” (like the 2012 NY Marathon that was canceled due to Superstorm Sandy). I’m referring to races shut down due to other reasons. My understanding about the Pasadena Half Marathon was that is was canceled due to the city refusing to grant a permit. Others seem to be falling victim to economics. But how is that possible? From all indications, marathons, half marathons and 10Ks seem to be enjoying their gravy days. The number of racers and races has utterly exploded in recent years. If you want, you can find a race every weekend to run. In fact, at times I have to choose between multiple races being run on the same weekend. As a runner, it’s a good dilemma and allows me to be selective. You can choose between big races that feature tens of thousands of runners, all the way down to races that cap at 1,000- 1,500 racers (or even smaller). So, why are some races falling by the wayside? Rock ‘n’ Roll, who also canceled their St. Petersburg Half Marathon in 2014, claimed it was a “difficult business decision” and like Pasadena was due to a drastic decrease of runners (St. Pete dropped from 7,021 in 2012 to 4,399 in 2013 and Pasadena dropped from 5,857 in 2012 to 4,964 in 2013). Are the LA 13.1, Pasadena R ‘n’ R Half and St. Pete R ‘n’ R Half victims of success? Has the increased number of races started dipping too deep into the runner pool? While there are a lot of us out there pounding the pavement, we are a finite number (no matter how large that number may be). Or is this the sign of some races worrying more about bigger profits and sacrificing less profitable ones in service of the almighty dollar? Business is business after all. Races are expensive to stage no doubt, but as race fees seem to be going up and up and up, I have to wonder about the economics. Are cities charging the races more for permits/support? Are the races themselves jacking up the prices because of the higher number of runners dying to race? Were we undercharged in the past and this is just the market correcting itself? I mean how much does a finisher’s medal really cost to make? I really don’t have an answer here. It’s more just an observation of mine. But this is a situation that bears watching should this trend continue (I fear it might). Will we see more “smaller” or less flashy (aka profitable) races disappear? I certainly hope not. I liked the LA 13.1 Race. It was a nice course near the water, a fun run and typically the first race of the year for me. I hope it comes back. It’s a Sunday in the middle of January and I should be racing right now. Posted on January 13, 2014, in General and tagged 13.1 Marathon Series, Cancellation, Pasadena Marathon, Race Permit, Rock 'n' Roll Series, St. Petersburg Half Marathon. Bookmark the permalink. 2 Comments. Which one was this? Pasadena? Or another one of the cancelled races? I’m really sorry to hear that. It hurts when a race you support (and want to make an annual tradition) disappears. Have you found a new race to take its place?